$43.76 Ships within 24 hours. AyurSlim has a favorable effect on weight reduction and lipid profiles. 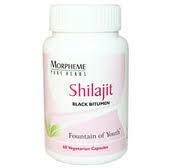 It is a researched ayurvedic herbal product, that can be safely used with no side effects. AyurSlim reduces the craving for food, thereby reducing the intake of fats and carbohydrates, leads to optimal utilization of nutrients and inhibits fatty acid synthesis, thereby reducing fat accumulation in the body. 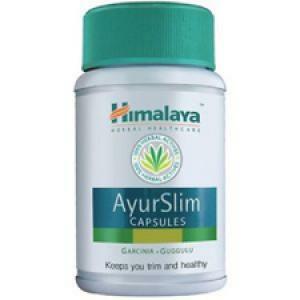 AyurSlim contains Garcinia which limits fat production in the body and aids in body weight reduction. Other essential ingredients are Gymnema, which reduces the craving for sweets and Indian Bdellium, which reduces excess cholesterol and triglyceride levels. This combination of natural herbs curbs food craving and controls the appetite which results in the consumption of fewer calories and the optimal utilization of nutrients. The recommended dosage is 2 capsules twice a day, after meals. AyurSlim should be taken in conjunction with a reduced calorie diet and half an hour of exercise on a daily basis. While you should start seeing results after four to six weeks, allow at least three months for complete results. Along with AyurSlim, maintain a healthy lifestyle and diet to achieve optimal results. AyurSlim is contraindicated (not advisable) in pregnancy. But it can be taken safely after lochia stops. AyurSlim is contraindicated in patients with jaundice and renal failure. In cases, where people are already suffering from problems like diabetes, cardiac problems & high blood pressure, it is preferable to take AyurSlim under medical supervision. Garcinia is known to slow down the body's ability to store fat, potentially enabling more fat from food to pass through the body without being stored. It also stops fat production. Indian Bdellium has strong purifying and rejuvenating properties. It strengthens immunity and regulates the body's lipid level. The herb is also known to reduce cholesterol and triglyceride levels. Gymnema leaves contain ingredients that reduce the intestinal absorption of glucose, stimulate the pancreas to increase insulin production and decrease sugar cravings. It also neutralizes any excess sugar present in the body. Chebulic Myrobalan purges impurities and detoxifies the body. It has a number of medicinal benefits, including improving bowel movements. Fenugreek seeds function as an appetite suppressant and give a feeling of satiety more quickly. AyurSlim is an ayurvedic herbal product. AyurSlim is not known to have any side effects if taken as prescribed. Garcinia cambogia (Garcinia, Vrikshamla) limits the synthesis of fatty acids in the muscles and liver. It also arrests lipogenesis (production of fat). Commiphora wightii (Indian Bedellium, Guggulu) reduces cholesterol and triglyceride levels. Gymnema sylvestre (Meshashringi) abolishes the taste of sugar and neutralizes excess sugar present in the body. Terminalia chebula (Chebulic Myrobalan, Haritaki) detoxifies the body and has purgative action. Trigonella foenum-graecum (Fenugreek, Medhika) effectively reduces weight.